jd: How did the ashram come to take over the land round here? DG: The place where Bhagavan's mother was buried was actually owned by a math, a religious institution, in town. The man who headed that organization had a high opinion of Bhagavan, so he handed over the land to the emerging Ramanashram. When Bhagavan's mother died, the devotees had to get permission from the head of this math to bury her on this land, but there was no problem since he was also a devotee. jd: And the first building, was it the shrine over the mother's grave? DG: Well, shrine is a bit of a fancy word. 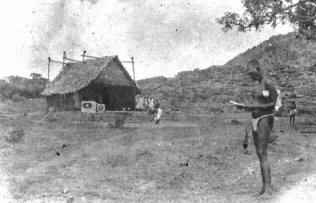 A really wonderful photo was taken here in 1922, shortly after Bhagavan settled here. The only building is a coconut-leaf hut. It looks as if one good gust of wind would blow it over. People who came to see him that year have reported that there wasn't even room for two people in the room where Bhagavan lived. That was the first ashram building here: a coconut-leaf hut that probably leaked when it rained. jd: It's very beautiful now - water, trees, peacocks. It must have been very primitive eighty years ago. DG: I talked to the man who cleared the land here. He told me there were large boulders and many cacti and thorn bushes. It wasn't really forest. It's not the right climate for a luxuriant forest, and there isn't much soil. The granite bedrock is often close to the surface, and there are many rocky outcrops. This man, Ramaswami Pillai, said that he spent the first six months prising out boulders with a crowbar, cutting down cacti and leveling the ground. jd: When the building started, was Bhagavan himself involved in that? DG: I don't think be built the first coconut leaf hut but once he moved here he was very much a hands-on manager. The first proper building over the Mother's Samadhi was organized and built by him. Have you seen how bricks are made round here? DG: It's like making mud pies. You start with a brick-shaped mould. You make a pile of mud and then use the mould to make thousands of mud bricks that you put out in the sun to dry. After they have been properly dried, you stack them in a structure the size of a house that has big holes in the base for logs to be put in. The outside of the stack is sealed with wet mud and fires are lit at the base. Once the fire has taken, the bottom is sealed as well. The bricks are baked in a hot, oxygen-free environment, in the same way that charcoal is made. After two or three days the fires die down, and if nothing has gone wrong, the bricks are properly baked. However, if the fires go out too soon, or if it rains heavily during the baking, the bricks don't get cooked properly. When that happens, the whole production is often wasted because the bricks are soft and crumbly - more like biscuits rather than bricks. In the 1920s someone tried to make bricks near the ashram, but the baking was unsuccessful and all the half-baked bricks were abandoned. Bhagavan, who abhorred waste of any kind, decided to use all these commercially useless bricks to build a shrine over his mother's grave. One night he had everyone in the ashram line up between the kiln and the ashram. Bricks were passed from hand to hand until there were enough in the ashram to make a building. The next day he did the bricklaying himself as he and his devotees raised a wall around the samadhi. Bhagavan did a lot of work on the inside of the wall because people felt that, since it was going to be a temple, the interior work should be done by brahmins. This was the only building that he constructed himself, but years later, when the large granite buildings that make up much of the present ashram were erected, he was the architect, the engineer and the building supervisor. He was there every day, giving orders and checking up on progress. jd: You say he 'abhorred waste'. Can you expand on that a little? DG: He had the attitude that anything that came to the ashram was a gift from God, and that it should be properly utilized. He would pick up stray mustard seeds that he found on the kitchen floor with his fingernails and insist that they be stored and used; he used to cut the white margins off proof copies of ashram books, stitch them together and make little notebooks out of them; he would attempt to cook parts of vegetables, such as the spiky ends of aubergines, that are normally thrown away. He admitted that he was a bit of a fanatic on this subject. jd: Going back to his building activities, how involved in day-to-day decisions was he? Did he, for example, decide where the doors and windows went? DG: Yes. Either he would explain what he wanted verbally, or he would make little sketches on the backs of envelopes or on scrap pieces of paper. jd: What you're describing now is a totally different Bhagavan from the one who sat in samadhi all day. Most people think that he spent his whole life sitting quietly in the hall, doing nothing. DG: He didn't like sitting in the hall all day. He often said that it was his prison. If he was off doing some work when visitors came, someone would come and tell him that he was needed in the hall. That's where he usually met with new people. jd: 'Got to go sit on the couch'. Bhagavan enjoyed all kinds of physical work, but he particularly enjoyed cooking. He was the ashram's head cook for at least fifteen years. He got up at two or three o'clock every morning, cut vegetables and supervised the cooking. 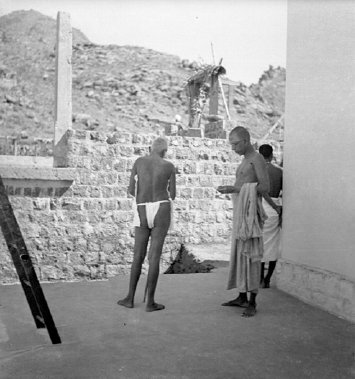 When the new ashram buildings were going up in the 1920s and 30s, he was also the supervising engineer and architect. jd: I think what you've just been speaking about is in a way very important in general. People have set ideas about Bhagavan. Most people have an image of him as a man who sat on a couch, looking blissful and doing nothing. What you are describing is a completely different man. DG: His state didn't change from the age of sixteen onwards, but his outer activities did. In the beginning of his life here at Arunachala he was quiet and rarely did anything. Thirty years later he had a hectic and busy schedule, but his experience of who he was never wavered during this later phase of busy-ness. jd: I like the way you're speaking because in a way you're debunking a lot of spiritual myths. DG: Bhagavan never felt comfortable with a situation in which he sat on a couch in the role of a 'Guru', with everyone on the floor around him. He liked to work and live with people, interacting with them in a normal, natural way, but as the years went by, the possibilities for this kind of life became less and less. One of the problems was that people were often completely overawed by him. Most people couldn't act normally around him. Many of the visitors wanted to put him on a pedestal and treat him like a god, but he didn't seem to appreciate that kind of treatment. There are some nice stories of new people behaving naturally and getting a natural response from Bhagavan. Major Chadwick wrote that Bhagavan would come to his room after lunch, go through his things like an inquisitive child, sit on the bed and chat with him. However, when Chadwick once put out a chair in the expectation of Bhagavan's arrival, the visits stopped. Chadwick had made the transition from having a 'friend' who dropped by to having a Guru who needed respect and a special chair. When this formality was introduced, the visits ended. jd: So he saw himself as a 'friend' not as 'the Master'. DG: Bhagavan didn't have a perspective of his own, he simply reacted to the way people around him thought about him and treated him. He could be a friend, a father, a brother, a god, depending on the devotee's way of approaching him. One woman was convinced that Bhagavan was her baby son. She had a little doll that looked like Bhagavan, and she would cradle it like a baby when she was in his presence. Her belief in this relationship was so strong, she actually started lactating when she held her Bhagavan doll. Bhagavan seemed to approve of any Guru-disciple relationship that kept the devotee's attention on the Self or the form of the Guru, but at the same time he still liked and enjoyed people who could treat him as a normal being. Bhagavan sometimes said that it didn't matter how you regarded the Guru, so long as you could think about him all the time. As an extreme example he cited two people from ancient times who got enlightened by hating God so much, they couldn't stop thinking about Him. There is a Tamil phrase that translates as 'Mother-father-Guru-God'. A lot of people felt that way about him. Bhagavan himself said he never felt that he was a Guru in a Guru-disciple relationship with anyone. His public position was that he didn't have any disciples at all because, he said, from the perspective of the Self there was no one who was different or separate from him. Being the Self and knowing that the Self alone exists, he knew that there were no unenlightened people who needed to be enlightened. He said he only ever saw enlightened people around him. Having said that, Bhagavan clearly did function as a Guru to the thousands of people who had faith in him and who tried to carry out his teachings. jd: During which period was Bhagavan actively involved in the building work? 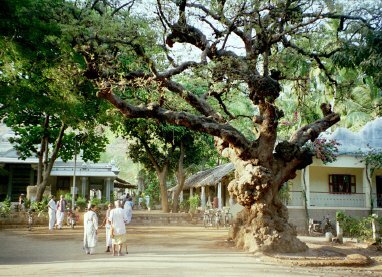 DG: The ashram started to change from coconut-leaf structures to stone buildings around 1930. The big building phase was 1930-42. The Mother's Temple was built after that, but Bhagavan wasn't supervising the design and construction of that so much. That work was subcontracted to expert temple builders. Bhagavan visited the site regularly, but he wasn't so involved in design or engineering decisions. jd: If anybody had visited during those twelve years they would have found a Bhagavan who was not sitting on the couch. They would have found him out working, supervising workers? DG: It would have depended on when they came. Bhagavan had a routine that he kept to. He was always in the hall for the morning and evening chanting - two periods of about forty-five minutes each. He would be there in the evening, chatting to all the ashram's workers who could not see him during the day because of their various duties in different parts of the ashram. He would be there if visitors arrived who wanted to speak to him. He walked regularly on the hill, or to Palakottu, an area adjacent to the ashram. These walks generally took place after meals. He would fit in his other jobs around these events. If nothing or no one needed his attention in the hall, he might go and see how the cooks were getting on, or he might go to the cowshed to check up on the ashram's cows. If there was a big building project going on, he would often go out to check up on the progress of the work. Mostly though, he did his tours of the building sites after lunch, when everyone else was having a siesta. He supervised many workers, not just the ones who put up the buildings. Devotees in the hall would bind and rebind books under his supervision, the cooks would work according to his instructions, and so on. The only area he didn't seem inclined to get involved in was the ashram office. He let his brother have a fairly free rein there, although once in a while he would intervene if he felt that something that had been neglected ought to be done. In earlier years, up to 1926, he would also walk round the base of Arunachala quite regularly. jd: Would a few people follow him? DG: Yes, large crowds would go with him in the later years, and when he passed through town there would be even more people waiting for him, trying to feed him, or attempting to get him into their houses. He turned down all these invitations. After the 1890s he never entered a private house in town. He stopped going round the hill in 1926 because people started fighting over who should stay behind in the ashram. No one wanted to be left behind, but someone always had to remain to guard the property. Finally he said, 'If I stop going there won't be any more fights about who is going to stay behind'. He never did the walk again. jd: You were saying he was a very natural person who liked very natural people. I presume he also liked animals. DG: Almost all of them. I have read that he didn't particularly like cats, but I don't know what the evidence is for that. As far as I can make out, he loved all the animals in the ashram. He showed a particular fondness for the dogs, the monkeys and the squirrels. jd: And they, presumably, lived in the ashram as well? DG: Bhagavan used to say that people in the ashram were squatting on land that belonged to the animals, and that the local wild animals had prior tenancy rights. He never approved of animals being driven away either to make more room for people, or because some people didn't like having animals around. He always took the side of the animals whenever there was any attempt to throw them out or inconvenience them in any way. He had squirrels on his sofa. They moved in and made nests in the grass roof over his head, they ran all over his body, and had babies in his cushions. Once in a while he'd sit on one and accidentally suffocate it. They were all over the place. jd: He sounds like a very natural person who felt it normal and natural to have animals around him. DG: It was natural and normal for him, but it was not natural and normal for many the people who congregated around him. Bhagavan always had to fight in the animals' corner to make sure they got proper treatment, or were not unnecessarily inconvenienced. 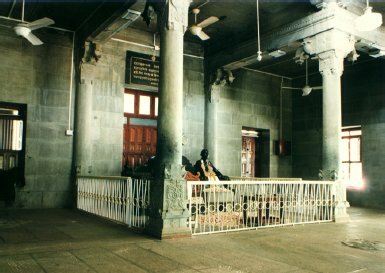 The big new hall, the stone building in front of the Mother's Temple, was built for Bhagavan in the 1940s. The old hall that he had lived in since the late 1920s was by then too small for the crowds of people that wanted to see him. The new hall was a large, grandiose, granite space that resembled a temple mantapam, but it was an intimidating place for some people and for all of the animals. There were no niches for them to sit in, or grassy materials to raid for their nests. Bhagavan also complained that the building would intimidate some of the poor people who wanted to come and see him. He always saw things like this from the side of the underdog, whether animal or human. jd: That large stone couch somehow seems to be for the wrong person. DG: Yes, that wasn't his style at all. There was a sculptor making a stone statue of him at the same time that the finishing touches were being made to this new hall. 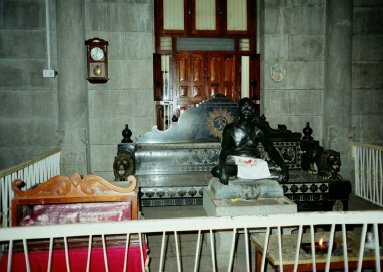 When Bhagavan was told that this new carved, granite sofa was for him, he remarked, 'Let the stone swami sit on the stone sofa'. He eventually did move into this hall because there was nowhere else where he could meet with large numbers of people, but he didn't stay there long. jd: And that was about a year before he gave up his body? DG: The temple over his Mother's samadhi was inaugurated in March 1949, and Bhagavan moved into the new hall shortly afterwards. He developed a cancer, a sarcoma, on his arm that year. It physically debilitated him to the extent that he couldn't walk to his bathroom and back. At that point his bathroom was converted into a room for him. That's where he spent the last few months of his life. jd: That's the place they call the samadhi room? DG: Yes. An energetic Tamil woman, Janaki Amma, came to the ashram in the 1940s. When she asked to be shown to the women's bathroom, she was told that there wasn't one. She arranged for one to be built, and this was the room that Bhagavan spent his final days in. It was the nearest bathroom to the new hall that he moved into in 1949. It became his bathroom at that time because no one wanted to inconvenience him by making him walk any further. He refused to let anyone help him when he walked to this bathroom, even when he was extremely weak. Have you seen the video of him in his last year? DG: It's excruciating to watch. His knees have massive swellings on them, and they seem to shake from side to side. It is clear from this footage that he was extremely debilitated, but he would never let anyone help him to move around. There is an elaborate stone step in the doorway of the new hall. Devotees would have to stand by, completely helpless, as Bhagavan would attempt to climb over this obstruction. No one was allowed to offer assistance. Eventually, when this step proved to be too much of an obstacle, he moved into the bathroom and stayed there until he passed away in April 1950. Next: It's called Who am I? but it covers all kinds of things: the nature of happiness, what the world is, how it apparently comes into existence, how it disappears. You say he 'abhorred waste'. Can you expand on that a little? You were saying he was a very natural person who liked very natural people. I presume he also liked animals.